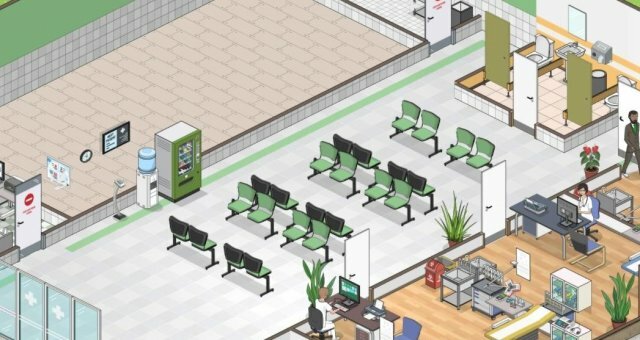 An accurate, detailed and complete guide on how to unlock every achievement in Project Hospital. The first and most straight-forward achievement that you'll earn right away, most likely in the tutorial. Interestingly enough, the second patient triggers this achievement, not the first one in the tutorial. Successfully treat 1,000 patients to unlock this achievement. This achievement is cumulative and progress can be made from playing the tutorial mode, campaign mode, challenge mode or sandbox mode. Simply complete the first tutorial level by curing four patients to unlock this achievement. This will unlock early on if you play the second tutorial. The ironic thing is you'll unlock this without adding any mandatory equipment in the room. Simply sectioning out your first room will unlock it. Build room without door access. You can earn this as early as the second tutorial level, or by simply playing the sandbox mode. Simply make a foundation and enclose it entirely around with a wall and no doors like so! Presto! Achievement unlocked! Congratulations, you placed your first object! Place your first object. I hope you didn't need a guide for that! Hire someone! As straight forward as it gets, right? 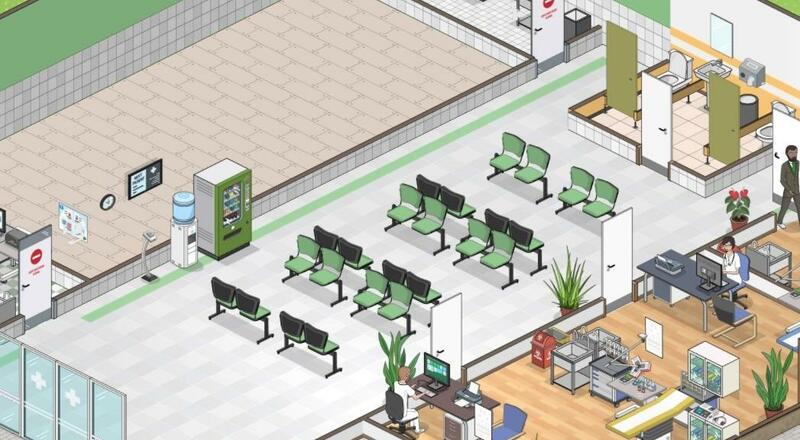 Simply complete the second tutorial level by constructing your first clinic and diagnosing six patients. Hire a total of 20 people over any number of playthroughs, tutorials or challenges. This achievement is cumulative and you'll earn it rather quickly. During the course of your playthroughs, place a total of any 15 prefabs (prefabricationed rooms) to unlock this achievement. It does not need to be on one playthrough/level, nor be properly staffed so just slap them down and you'll earn this achievement fairly quickly. Hire 5 staff members with the 'alcoholic' perk. Hire any five staff members with the perk of being an alcoholic. You can either earn this over your career naturally, or seek them out (I don't know why you would want to) and hire them. You'll probably need to pay to have the hidden perks revealed. Just look out for the mug icon, which indicates the person has this "desired" perk. Hire them and earn this achievement and a vast amount of disappointment in them! Simply complete the third tutorial level by constructing, managing and monitoring your hospitalization ward. Simply follow the instructions provided and you'll unlock this achievement. Rotate an object 4 times before placing it. Rotate any prefab room or single object at least four times before placing it. You can rotate objects using the default hotkey R.
Place and then move any 50 objects to unlock this achievement. Interestingly enough, you can also delete any single object and it will count towards your move quantity. I guess deleting an object is kind of like moving it. You're moving it into oblivion. Buy and place any 100 objects to unlock this achievement. This achievement is cumulative and can be earned in sandbox mode, challenge mode, campaign mode or the tutorials. Place and then remove any one room to unlock this achievement. 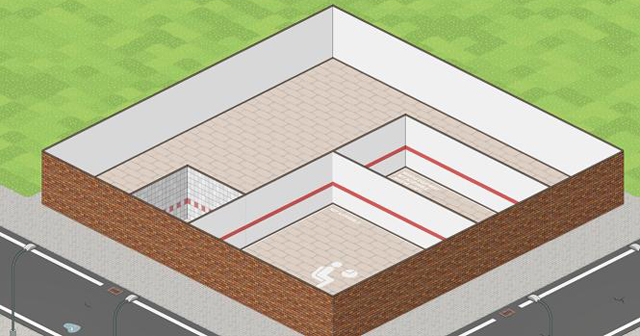 You can find the Remove Room option under Building Mode [F6] --> Prefab --> Remove Room (Bottom-right corner). Build a new floor on any hospital to unlock this achievement. It can be done in sandbox, campaign or challenge modes. 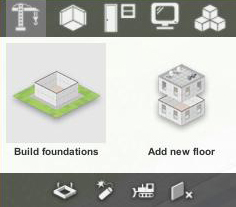 Just look for the Add New Floor option under the construction menu, select your specifications and build your new floor to unlock this achievement. The same as the above achievement Going Up, but this time you'll need to build all the way to the top floor to unlock this achievement. You can have a total of four floors. Have your janitors clean 10000 tiles. This achievement is cumulative and can be earned playing the tutorial mode, campaign mode, challenge mode or sandbox mode. There's no need to grind specifically for this achievement, as you'll earn it most likely in >15 hours of gameplay. What this achievement means is that you just need to accept an insurance carrier for your hospital. You can also simply cancel a pre-existing one and then re-enable it and this achievement will unlock. If you want a quick method, just go to campaign #1, In Debt, bring up the insurance window, cancel one and then enable it again. Fire any 20 employees over any game mode. You can find the ability to fire under any employee's card under the option Dismiss Employee. Get to kickin' them to the curb! Complete campaign #1, In Debt, also known as level 4 to unlock this achievement. Pay debt to the bank in only 20 days in level 4. This achievement is rather bugged. Some players point out that completing campaign #1 (level four) in under 20 days is the way they unlocked this achievement, while others, like myself, loaded a different map entirely and this achievement unlocked at random. In fact, I unlocked this achievement prior to even completing level four, so your experience may vary. Complete campaign #2, Inefficient, also known as level 5 to unlock this achievement. Complete campaign #3, State Grant, also known as level 6 to unlock this achievement. Save the environment one trash can at a time. Place them naturally as you play the game, or buy them in bulk and place them at a whole sale level. If one trash can is useful, then 30 in the reception area must be even better, right? Buy and place any 100 decorations over the course of your playthroughs, whether they be indoor or outdoor, logical or illogical. So grab a potted plant or two, or a hundred and get to decorating. Very nice indeed! Buy and place any 30 trees to unlock this achievement. Much like the previous two achievements, you can either place them tastefully or haphazardly around. Happy Arbor Day everyone! Now get out there and plant some trees! Buy and place ten satellites to unlock this hidden achievement. 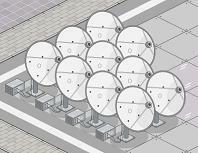 Satellities are located in the "Outdoor Objects" tab of the building menu. They are a decoration item only and cost $49 each. You'll need to have $700,000 in your budget (i.e. spending money) at any one time to unlock this achievement. You can amass $200,000 and then borrow the max amount in loans if you want to hit exactly $700,000 and unlock this achievement sooner. You'll need to build, properly staff and open all eight departments in one hospital to unlock this achievement. Complete challenge level one by completing all necessary tasks as instructed to unlock this achievement. Complete challenge level two by completing all necessary tasks as instructed to unlock this achievement. Complete challenge level three by completing all necessary tasks as instructed to unlock this achievement. Complete challenge level four by completing all necessary tasks as instructed to unlock this achievement. Complete challenge level five by completing all necessary tasks as instructed to unlock this achievement. Complete challenge level six by completing all necessary tasks as instructed to unlock this achievement. Complete all objectives in level 6. As mentioned, complete all listed objectives in level six, also known as campaign #3, State Grant to unlock this hidden achievement. Assign chief doctor with good boss perk. For this hidden achievement, you'll have to assign your chief of medicine to someone with this perk for it to unlock. You'll be looking for the megaphone icon, which indicates they would make a good chief of medicine. Once you hire them, assign them to the position and this achievement will unlock. Build over 1000 tiles of walls. This hidden achievement requires you to build at least 1,000 tiles of walls over the course of playing the game. This achievement is cumulative over all building ever done. This hidden achievement requires that you spend at least $1,000,000 over the course of playing the game. This achievement is cumulative over all spending ever made. Let 10 clinic patients collapse. This hidden achievement requires that you let (on purpose or on accident) 10 patients collapse in the hallways. This achievement is brought to you by Life Alert®. Help! I've fallen and I can't get up! This hidden achievement requires that you place 1,000 individual objects. This achievement is cumulative over all objects ever placed. Diagnose correctly 20 times under your care. This hidden achievement requires that you take control of 20 different patients at some point and correctly diagnose their respective illness. Much like the above achievement, "Doctor Right", you just need to toggle the control option to you instead of the NPCs. Do this with 30 patients total to unlock this achievement. Take over a patient from the clinic and have him wait for more than two game hours. This hidden achievement reuiqres that you have a patient (any) enter your clinic. Quickly take control of said patient and then speed up the time to the maximum and have him/her wait for two in-game hours. Once the specified amount of time has passed this achievement will unlock. Much like the other "Place X amount of items...", this hidden achievement requires you to place a total of 30 bio-hazard trashcans (bins) in total during the course of your playthroughs. So get to placing! You can never be too careful! This hidden achievement requires that you send a total of 20 patients home over the course of your playthroughs. Broken arm? Go home! Kidney stones? Go home! All of you just go home! This hidden achievement requires that you place a total of 30 toilets over the course of your playthroughs. You can find these under the Furniture, Equipment, Decorations --> Furniture and Accessories. Place 30 eye test posters. This hidden achievement requires that you place a total of 30 eye test posters over the course of your playthroughs. You can find these under the Furniture, Equipment, Decorations --> Medical Equipment. Have 30 patients under your care undergo Xray examination. This hidden achievement requires you to first and foermost, have functioning x-ray abilities within your hospital. Next, you'll need to put the patient under your control and then send them to have x-rays done. Do this 30 times to unlock this achivement. Take blood from 50 patients under your care. This hidden achievement requires you to first and foermost, have a functioning lab so you can take blood and test samples. Next, you'll need to put the patient under your control and draw their blood as part of their treatment. Do this 50 times to unlock this achivement. Misdiagnose 20 patients under your care. This hidden achievement requires you to first and foremost, take control of any given patient and put them in your care. Next, you need to guess their illness incorrectly. Do this 20 times over the course of your playthroughs to unlock this achievement.